Chocolate chip banana bread reminds me of my dear old grandmother. She used to make a wonderfully moist bread that simply melted on your tongue. Grandma used to make all sorts of sweetbreads for us kids when we were little. My favorite was her old-fashioned chocolate chip banana bread. Grandma’s banana bread was different than other banana bread because she would add things to it like peanut butter chips or chocolate chips. The tiny morsels of candy always gave the bread a good bit of texture. When the chocolate chip banana bread came out of the oven it was always so gooey and delightful! Grandma never waited for the chocolate chip banana bread to cool before slicing off a piece for my siblings and me. She knew we had been waiting for that bread to come out of the oven like eager little beavers. I bet your curiosity is piqued about this recipe, yes? Flip on over to the next page for the yummy details! 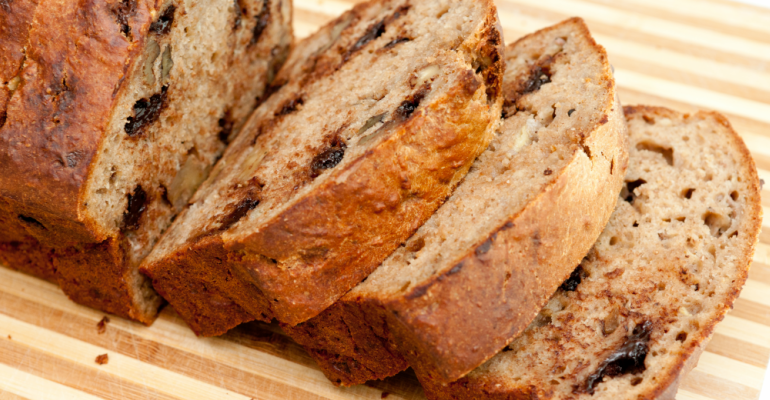 USE THE RED NEXT PAGE LINK BELOW FOR THE CHOCOLATE CHIP BANANA BREAD RECIPE. Quick Tip: This chocolate chip banana bread freezes up really nicely.